'It was always difficult being Harry Potter and it isn't much easier now that he is an overworked employee of the Ministry of Magic, a husband, and father of three school-age children. 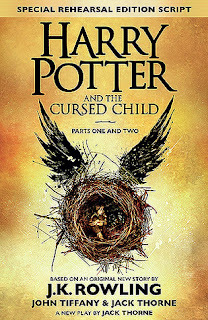 The Cursed Child is a supplement to the well known Harry Potter series and one thing different about this book is that the same is written as a play and not prose. The previous time I read a play was Hamlet and it wasn't a very pleasing experience to read a play and moreover, I was never one of those Potterheads to be satisfied with the mere appearance of Harry Potter (even though I am familiar with the story as per the book, not just movies) in a book and hence, I started reading the book with absolute neutrality. If you aren't familiar with the Harry Potter series and planning to read / watch it in the near future, I suggest you don't proceed with this review considering even though the play can qualify as a standalone, there might be some spoilers / references to earlier books. 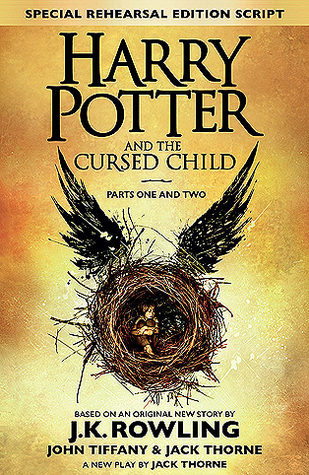 This book picks up exactly where The Deathly Hallows left off; nineteen years after the Battle of Hogwarts. Harry is now with the Ministry of Magic; head of Law Enforcement, Hermione is the Minister of Magic and Ron is running the joke shop inherited from his twin brother. Harry's second son, Albus' fear turns real when he is sorted into Slytherin house; and he is unable to keep up with the expectations of being Harry's son and he finds a friend in Scorpius, the son of Draco Malfoy, Harry's nemesis during his school years. Albus is desperate to create an identity of his own and on the other hand, Scorpius has his own battles considering how people believe him to be Voldemort's son. To start with, I felt this was a very well narrated play, bringing out the background, mood and emotions of the characters involved before the dialogue, helping the reader visualise what is going on. Very often, a play ends up as a dump of dialogues and it is very difficult to comprehend what is going on unless you watch it as a play. My favourite aspect of this book was the role of the two members of the Malfoy family, Draco was an extremely mature adult and in fact, he was the one who brought a desperate who was acting on impulse back to normal. Scorpius Malfoy, on the other hand, was an extremely loyal friend, was a way too pragmatic for his age which was shown through the way in which he handled people's inherent distrust in him owing to the suspicions. Usually, a revival never lives up to its expectations but I believe this book had a decent plot and at no point in time I was bored, even though, the time travel is not a concept which is new to most readers and that happened to be the crux of this book. Another excellent aspect is that it was an extremely light read, despite the book being deceptively bulky (around 330 pages), I managed to complete the book in three hours, considering it was a play and you can read through it fairly quickly. With that said, this book followed the same pattern that was followed in the first five books of the series, that is, Harry's scar hurts, Voldemort is going to come. I genuinely felt that the series could have been revived with something different rather than it being a case of an old wine kept in a new bottle. I read one of Rowling's interviews recently and I am glad that she isn't going to write any other book in this series, considering, I am tired of this predictable sequence of events. Moreover, I felt that Ron wasn't adequately used in the book, and was a mere comic relief even though he had a very significant role in the first seven books but then, Draco taking that role wasn't a very bad idea either. Time travel forms the crux of the novel but then, in many cases, it ended up becoming an excuse for repeating old events mentioned in earlier books. The book also repeatedly talked about Harry being overworked at the Ministry though it was merely said and was never demonstrated; except for one instance where Harry's office is full of papers because he is not interested in paperwork; that only indicates lack of interest and not an overworked staff. There were also certain logical inconsistencies on a closer look but I wouldn't disclose it here since it would inevitably contain spoilers; however, I am open for a private discussion on the same. This book is excellent for light reading, with a decent but predictable and ordinary storyline which would be loved by Potterheads and enough to satisfy the moderates (like myself). I would award the book a rating of six.